Last weekend I had the fortune of visiting one of the most important wine regions in Spain, historically speaking that is. San Lúcar de Barrameda is located on the southern coast of Spain at the point where the river Guadalaquivir runs into the Atlantic Ocean. What makes this city so important is that it for centuries has been one of the three biggest producers of sherry. Now I know I have spent a lot of time on the subject of sherry and I don’t want this site to be only about sherry. But I do feel that there is a lot to say on the subject and I hope my readers enjoy the information that I share. That being said I want to tell you about my visit to the Bodegas La Cigarrera. Taking it’s name not from a cigarette producer but rather from the name given to the ladies who once sat on the street of San Lúcar rolling cigars for the passerby’s. La Cigarrera is one of the oldest Bodegas still making Sherry. It is also one of the smaller producers with only a production of 40,000 liters(around 4400 cases) of wine with the majority being made up of their Manzanilla. To clear up any confusion lets first focus on what Manzanilla is. Sherry is a wine that is produced in the region of Jerez which is made up of 3 main towns: San Lúcar, Jerez de la Frontera, and Puerto de Santa Maria. In this area almost all of the wine produced has the right to be called Sherry or Vino de Jerez. That includes wines that are very dry to very sweet and everywhere in-between. With this bit of knowledge we can also say safely that any bottle of Sherry you pick up is most likely made from one of two grapes: [Palomino Fino->http://twis.info/grape.php?ID=324&select=p] and [Pedro Ximenez->http://twis.info/grape.php?ID=325&select=p] though at times you’ll find a bottle of Moscatel thrown in for good measure. Now the confusing part is that within this somewhat simple explanation is the fact that there are 5 main styles that you will run into on a regular basis. So where is Manzanilla on the list, well the short answer is that it falls into the category “fino”. Meaning a dry white wine that is delicate and lightly fortified. The long answer is that Manzanilla is a wine based entirely on the idea of “terroir”. Terroir is the French word that sums up the idea of place. Meaning that the land, climate and soil all contribute to the style of wine that is being made. With Manzanilla we have a wine that is stubbornly unable to be replicated outside of one small zone in the town of San Lúcar. You see Manzanilla is a Fino style of Sherry that can only be made in what I would guess to be about 1 kilometer of land in the center of San Lúcar de Barremeda. In fact I talked to the owner of La Cigarrera, Ignacio Hidalgo and he informed me that a short walk out of town would lead you to areas to where you cannot produce this product. How can this be? What is happening here? The answer is only partially known. 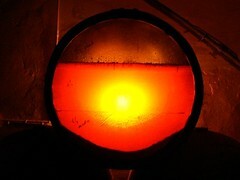 To make sherry the most important factor that shapes all styles of the wine is weather or not the wine produces a flor. Flor as I mentioned in a previous article is the yeast ah grows on the surface of the wine protecting it from oxidation. When this flor grows on a wine the wine can become one of 2 styles either Fino if the flor stays strong during the life of the wine or Amontillado where at some point in the wines development the flor dies off. Since this flor is a living thing it is subject to the air temperature and humidity around it. In most cases this means that the flor changes in thickness during the seasons waxing and waning in size, allowing a small amount of oxidation to take place. In San Lúcar this is not the case. Due to a variety of factors the wines here that do have a flor do not see this flor change at all, but rather remain constant. Some believe this to be the only reason for the difference in flavor between a Manzanilla and any other fino sherry. Either way if you sit down with a glass of Manzanilla and a glass of fino you’d be hard pressed not to see a dramatic difference. Same grapes, same fermentation, same strain of flor even the same geographic region, the DO sherry is only 10,496 ha in size. So moving on to the sherry at hand and the Bodega La Cigarrera. Established in 1785 it is actually a small part of the Nunnery that is attached to its side. Long ago a man called Don José Colon Darbo set to buying up properties in the area for his growing wine trade. Today La Cigarrera sits nestled into the old city tucked into narrow roads where not much has changed. Walking in the side door you are led past stacks of 100+yr old American oak barrels that are stacked 3 high on both sides. Cobwebs and dust cover everything and make you wonder how they can produce a sanitary product. The reality is that these spiders are necessary to produce a healthy wine. Old wooden barrels are vary attractive to all sorts of bugs and so save them from becoming hole ridden the spiders exchange pest control for free rent, not a bad deal. Moving in further you come to a court yard that at one time might have been open to elements but now boasts a thick canopy of vines covering it so thick that lights are needed to find your way.